^ "Luddites and Luddism" extract from Binfield, Kevin ed., Writings of the Luddites Baltimore, Maryland: The Johns Hopkins University Press, 2004. Accessed 4 June 2008. 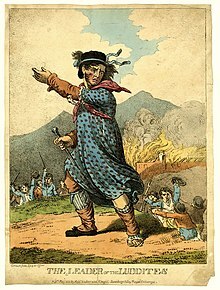 ^ Anstey at Welcome to Leicester (visitoruk.com)[リンク切れ] According to this source, "A half-witted Anstey lad, Ned Ludlam or Ned Ludd, gave his name to the Luddites, who in the 1800s followed his earlier example by smashing machinery in protest against the Industrial Revolution." ^ Karl Marx, Capital Vol. I, Ch. 15, Sect. 5.